Sandwich: On a square of aluminium foil (30x30cm) place a slightly smaller square of baking paper. Brush one side of a piece of bread with olive oil and place it on the paper oil side down. Cover the other side of the bread with a laywer of pesto, 2 slices of tomato, and 2 slices of mozzarella. Finosh with a few extra blobs of pesto , then add a second slice of bread on top, and brush the top with more olive oil. Close the foil around the sandwich by wrapping up 3 sides, and cook for 4 minites at full power in a toaster. Fondue: Melt the small mozzarella balls in a saucepan with the white wine, and season with salt and pepper. Cut the bread into crouton size and shape, and brush them with a mix of the chopped garlic, thyme and olive oil. Bake for 5 minutes at 180°C. Make skewers of a cherry tomato, a basil leaf and the toasted crouton then dip them in the fondue. 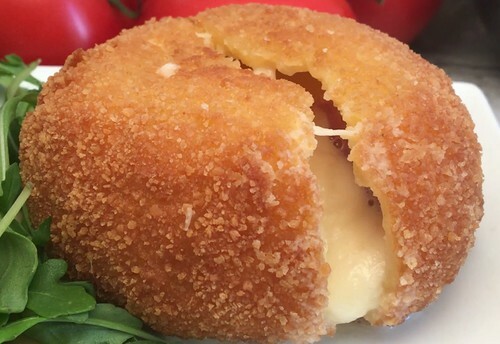 Croquette : Cut the top of the large mozzarella balls to create a hat, leaving one edge still attached. Hollow out the middles and stuff them with chopped tomato, half a slice of parma ham and a basil leaf. Coat the balls in flour, beaten egg and breadcrumbs and fry them for 4 minutes in hot oil. Enjoy all your creations!